It works best for real time customer relations and monitoring. For historic data use it with another tool. Other than that it is an amazingly easy to use, and to set up tool. Once you start using it, you will never go back. Allows us to see current trends and product engagement. Also allows us to compare unique visitor counts with relevant dates. You can go big as you need, and pay as you need with instantly upgradable and affordable plans. You can always directly communicate with your customers by integrating another component to your site. As said, it worked pretty well. Especially on launch day to gain real time usage data (and circulation on twitter of the piece). GoSquared is easier and more intuitive to use, also less advanced but it offers enough functionality for most websites. It can be used in conjunction with more advanced tools. 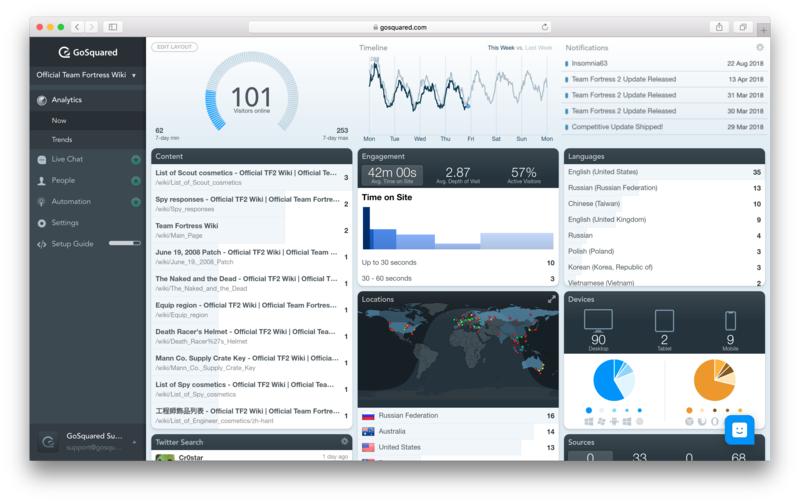 GoSquared Free - Access to the Now and Trends realtime web analytics dashboard. GoSquared Analytics - Everything included in free plus premium analytics features. GoSquared Suite - The most popular GoSquared plan, full access to our real time analytics dashboards, intelligent live chat and customer data hub. GoSquared Free, track up to 1000 pageviews a month. GoSquared Analytics, track up to 100k pageviews a month with pricing starting at £29/month. GoSquared Suite, track up to 100k pageviews a month with pricing starting at £79/month.